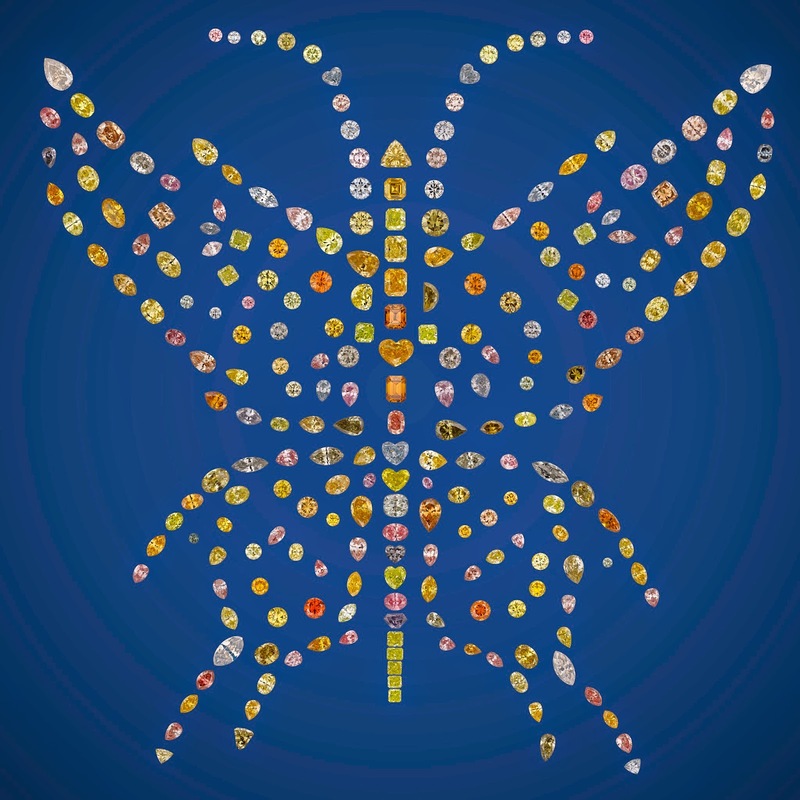 Beginning September 13, 2014 and until January 6, 2015, we will have a special reunion of diamonds at NHM: The Blue Moon Diamond will meet the Butterfly of Peace diamond collection. The collection of 240 natural fancy-colored diamonds that make the spectacular Aurora Butterfly of Peace is already worldwide renown and well traveled: it had been on special exhibits at the Smithsonian Institution and at the Houston Museum of Science, just to cite only a few of the prestigious places it has seen. The Butterfly of Peace will have a new companion beginning September 13: The Blue Moon Diamond, which was recently discovered in South Africa. 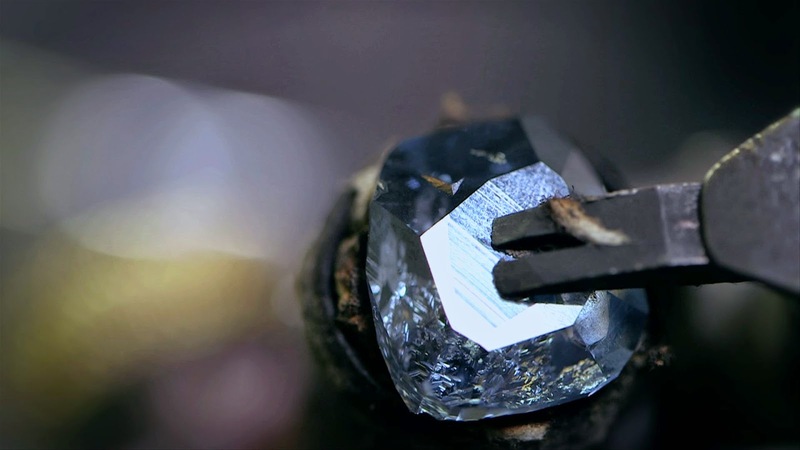 Now faceted from the 29.6-carat rough, the 12-ct stone will also be displayed in the Gem Vault of the Natural History Museum of Los Angeles County. The renown Aurora Butterfly of Peace: 240 natural fancy-colored diamonds. All known colors of diamonds are represented in this unique and exceptional collection totaling 167 carats of beauty. The collection is not only a delight for the public but also for the scientists to study. The variety of colors makes it the best tool to analyze the color in diamonds. On loan from Aurora Gems. Photo by Robert Weldon. Copyright: GIA. 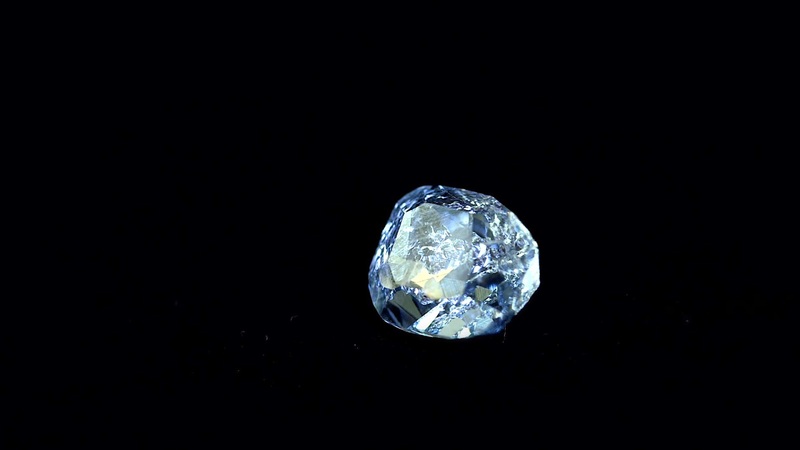 The 12-carat Fancy Vivid Blue Moon Diamond. 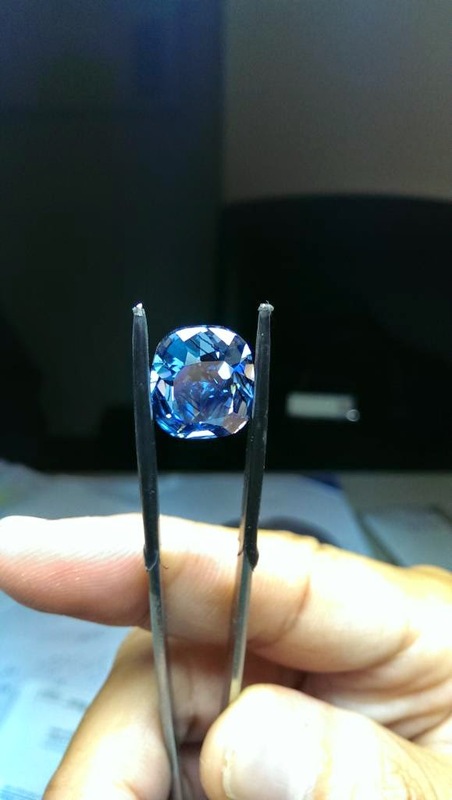 Recently discovered in South Africa, this diamond shows the most exquisite of the blue colors. Such as the Butterfly of Peace diamond collection, the Hope diamond, or the Wittelsbach-Graff, it was studied at the Smithsonian Institution before coming on exhibit to our museum. On loan from Cora International. Photo by Tino Hammid. Copyright: Cora International. Add 240 fancy-colored diamonds, the rarest of all the gems. 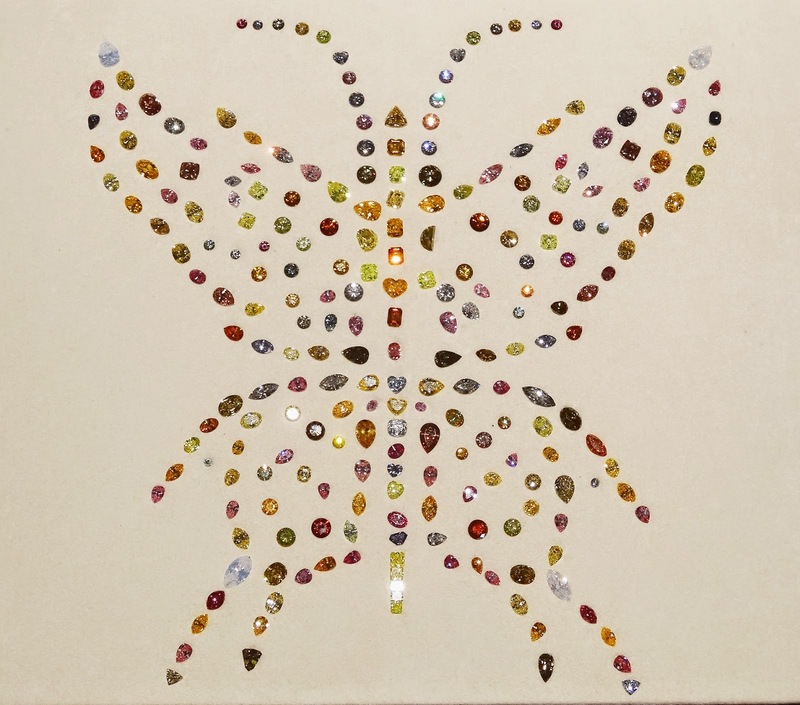 Arrange it carefully in a butterfly shape that took the owner (Aurora Gems) over 10 years to put together. Obtain a delightful art-piece that will be a joy for the public and the connoisseur to look at! The Aurora Butterfly of Peace on exhibit at NHM. Photo and copyright: K. Stone. The Aurora Butterfly of Peace as seen on its display case. Photo and copyright: E. Gaillou for NHM. A different look at the Butterfly of Peace! Photo and copyright: E. Gaillou for NHM. 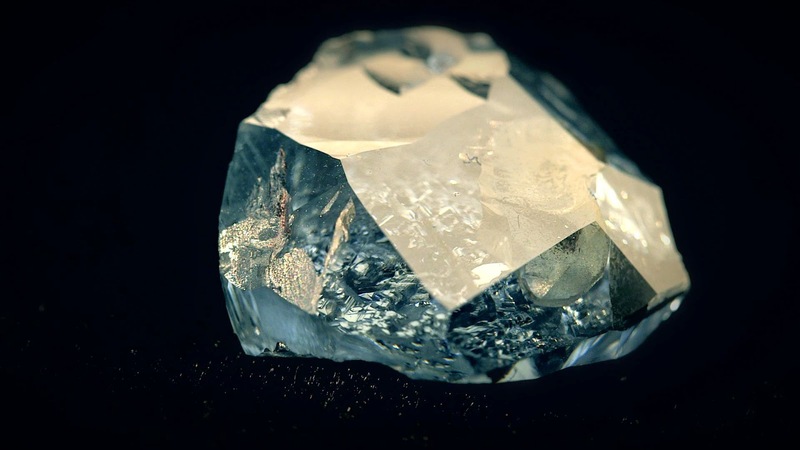 The 29.6-carat rough stone was unearthed at the Cullinan Mine in South Africa by Petra Diamonds in January 2014. In February, Cora International bought it and began the cutting process in April 2014. The cut stone was finished at the end of June. The photos below show you a few steps of the cutting process from the rough to the cut stone. 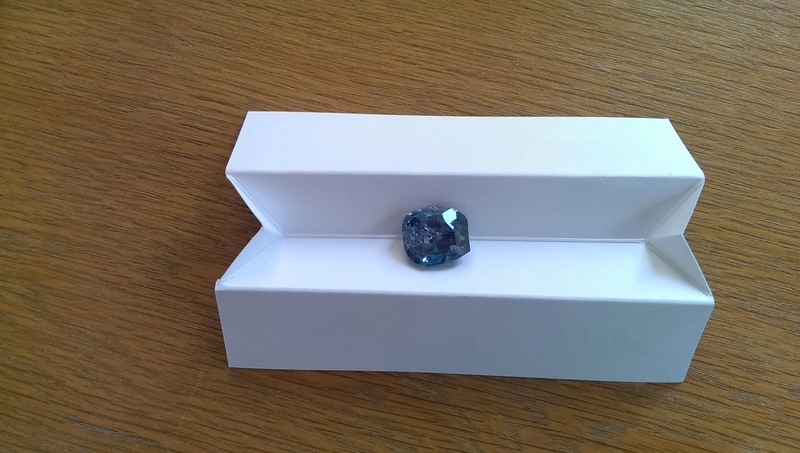 Before cutting the blue stone, models of it were made and cut. No rough stone is perfect to begin with, and inclusions and impurities have to be avoided during the cutting process so that the cut stone doesn't have any inclusion in it. The design of the stone was so well done that the stone has been graded "Internally Flawless" by GIA. 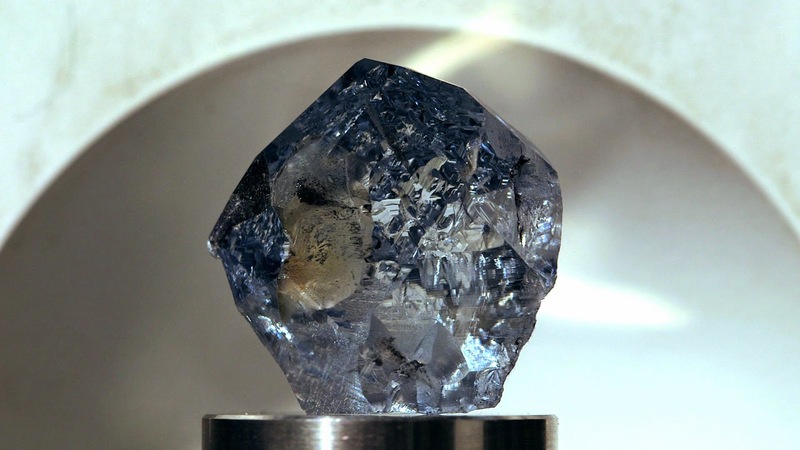 The rough 29.6-carat Blue Moon Diamond on the cutting wheel. Copyright: Cora International. The first "window" is open in the diamond. It is from this first facet that the other ones will be built from. Copyright: Cora International. More facets are polished. Isn't it scary to see such a valuable diamond in such position?! Copyright: Cora International. Some of the front facets are polished, while the back of the Blue Moon is still rough. Copyright: Cora International. 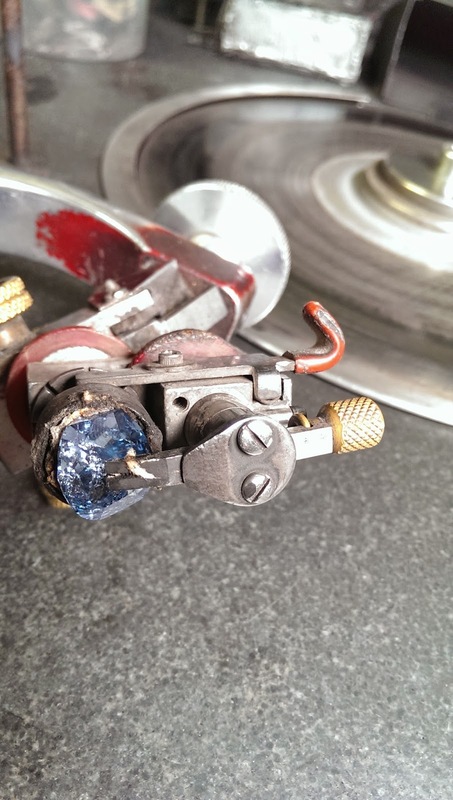 The Blue Moon diamond on the cutting wheel. Copyright: Cora International. Almost there! But still a few more facets to be cut on the back of the stone. Copyright: Cora International. On this shot, we already can see the finished shape of the stone. It begins to look like a little brother of the Hope diamond! 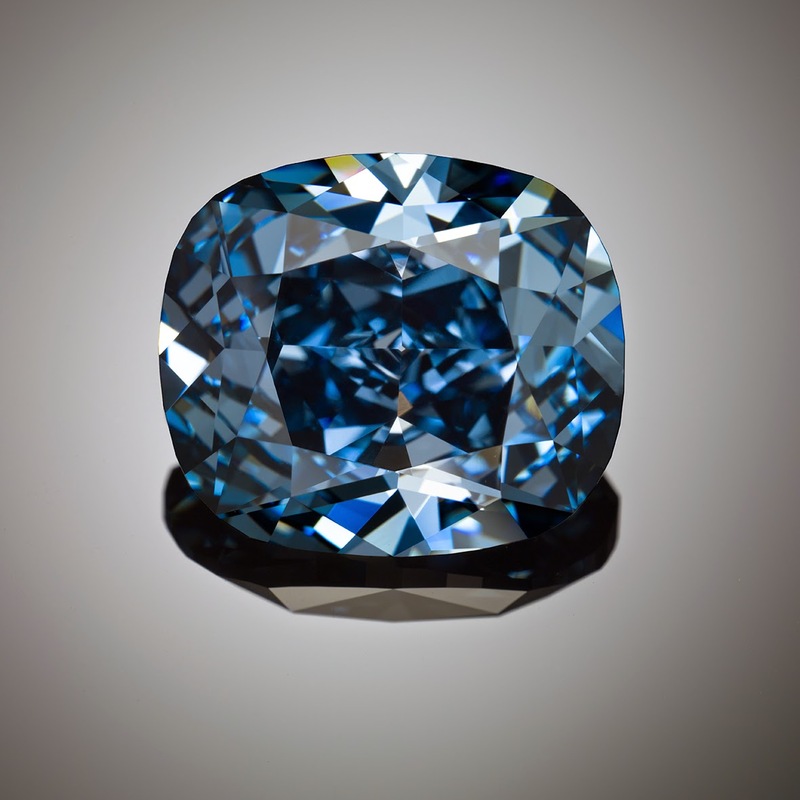 The Blue Moon Diamond will be on display in the Gem Vault of the NHM from September 13, 2014 until January 6, 2015, next to the Butterfly of Peace diamond collection. It will most likely be the ONLY public appearance of this diamond, so rush in! Especially that you can see this special reunion of exceptional diamonds with a regular NHM admission.